Dog collars and tags in the UK. Make sure you follow the law! Did you know that in the UK you can get fined up to £5,000 if your dog fails to be microchipped and wear an ID tag? MY DOG IS MICROCHIPPED, DOES HE/SHE STILL NEED TO WEAR A COLLAR AND TAG? The answer to this question is simple: yes, it’s the law! Many people know it’s illegal to not have their dog microchipped, however, not many know it’s also illegal if their dog is not wearing a collar and ID tag out in public. The Control of Dogs Order 1992 very clearly states that any dog must wear a collar with the name and address of their owner inscribed on the collar or tag. 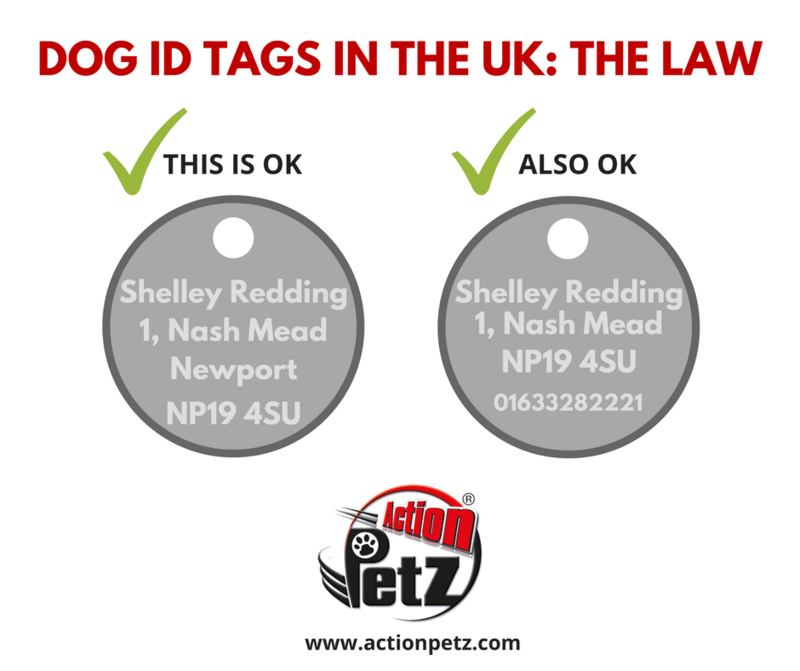 Your name, house number/name and postcode is all you need to put by law on your dog’s tag, however, at Action Petz we recommend you also put a phone number to make it easier to reach you in the unfortunate event of your dog getting lost. There’s also a bit of debate on whether to put a dog’s name on a tag or not; some dog owners like to put their dog’s name, while others argue it’s best not to add it to the tag as it might make it easier to steal a dog. MY DOG WEARS A TAG ATTACHED TO HIS HARNESS, DOES HE STILL NEED A COLLAR? The answer for this is yes. 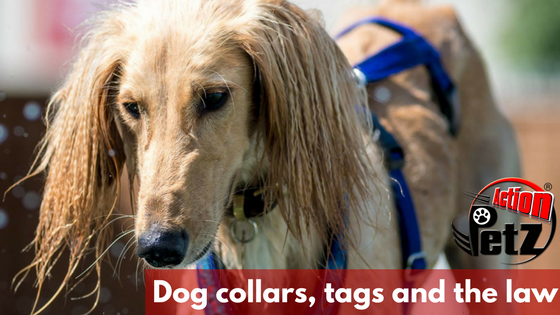 We understand that an increasing number of dog owners prefer to attach their dogs to a harness as it’s less harsh on the neck, however, dogs wearing a harness must wear a collar with an ID tag. Because we’re a public space, Action Petz requires all of its canine members to wear a collar with an ID tag (even if your dog wears a harness), this requirement is part of our park rules and must be followed by all dogs. You can find dog collars in our centres as well pet retailers, from simple ones to specialised ones. For very small dogs or puppies, a soft, lightweight collar makes an excellent choice. Whatever type of collar you choose, make sure there’s an up-to-date tag attached to it.